Musings on Design, DIY Projects, & Life in the 'Burgh. One of the biggest tasks that I faced when I moved in with Alex was sorting and organizing our combined things. Alex was not born with the organizing gene and my neat freak tendencies had taken a backseat to Architecture School. I think it probably took me a month and a half of near full time unpacking/decorating/sorting before I got everything in its proper place. The one problem --because I did all the organizing on my own, my husband is still learning where everything is and where things go. I get the standard "Where did you put my _____?" question a lot and sometimes find things in the wrong place. We're working on it. As you may have noticed on our floor plan, we're very fortunate to have 2 walk-in closets in our apartment (though we still rely on some of our furniture pieces for storage quite a bit). In our master bedroom, to supplement our dressers, I placed modular cubes from college on our upper shelves for additional clothes storage. Alex had 2 Febreze bins that I made him buy a couple years ago for sweater storage and a hanging shoe rack (hidden in this photo) that we used for his shoes. I also had a particle board shoe shelf from my room growing up which I supplemented with two college dorm-era stacking storage bins for the rest of our shoes. I also used an additional storage bin for scarves. The black plastic drawers were something I used for office supplies in my first year dorm which now works perfectly for things like nail polish, pedicure sets, and travel supplies. I also have a multi-hook over the door hanger for purses. Because we don't actually have a designated linen closet, we use the closet in our guest bedroom/office for linen (and coat storage) among other things. I originally bought the closet organizers to use as a base for my college desk which was essentially a door. The drawers belonged to Alex and now house batteries, spare keys, and assorted gadget accessories. When our apartment was Alex and Dylan's bachelor pad, the laundry room was a disaster area. Alex's love of recycling and his busy schedule did not mesh well, resulting in massive piles of cans, cardboard, and other smelly containers. After our wedding, we invested in some ~$7 stacking bins from Sears to sort and store all of the recycling. We have 6 bins in total each with a particular designation (plastic, steel, aluminum, mixed paper, glass, and brown paper). Initially, our apartment complex offered no recycling services so we were taking our recycling to a local recycling center. Immediately after we purchased the bins, we found out that our landlords would be offering a form of single stream recycling and that we did not need to sort our recyclables. Oh well. At least we can neatly store away our recyclables until all 6 of our 18 gallon bins get full! Aside from our designated storage rooms, I wanted to share a few more recent organizational tools that I adopted as part of a hey-it's-a-new-year effort. 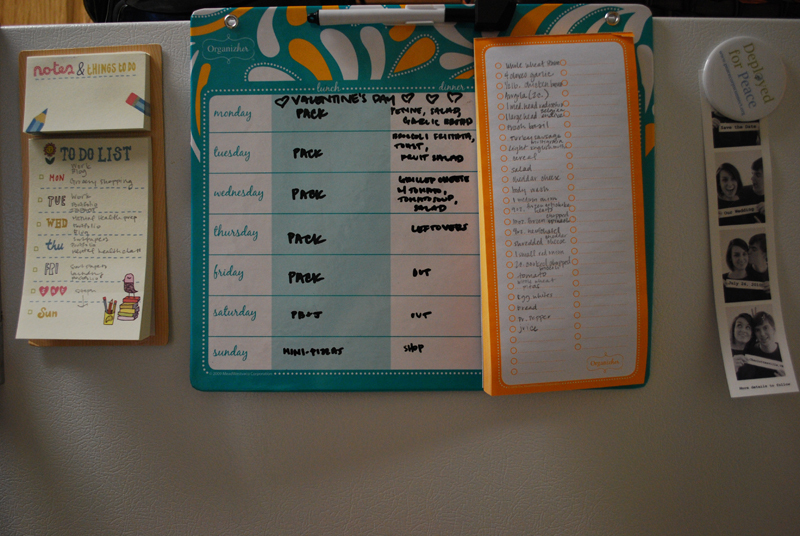 I do pretty much all of the meal planning and grocery shopping at our house so I decided to invest in a magnetic notepad to make things a bit easier. I spotted this magnetic meal planning board at Target and snagged it. It's a dry erase board with columns for lunch and dinner with grocery list attached. I find it especially useful since I don't like making trips to the store more than once a week. I also got this nifty magnetic to-do list from Santa last Christmas. This dry erase/bulletin board I bought in college for my roommates and I to use. I hang notices from our landlord on it and Alex and I leave each other notes. Obviously these pictures are a bit older, but I invested in a large calender to encourage Alex and I to communicate a bit better about our evening and weekend activities. So far, we haven't been as diligent about writing things on it but I think it's a step in the right direction (did you notice the birds?). Both the large calender and my pocket calender were designed by a company called Egg Press. I love the simple line designs and typography -- as well as the weekly layout in the pocket calender. It's a nice size, too. My other recent organizational purchase was this leather chest from Target. We have a wicker chest in our bedroom which we use to store blankets but I got tired of always walking in there to grab one when we were watching television. Plus, between the two of us, we had so many blankets and throws that they wouldn't all fit in one place (we have lots of beautiful afghans that Alex's mom knitted in addition to quite a few fleece blankets). This leather chest was the perfect solution. We also thought that we might be able to store some toys in it for our nephew for when he visits. Just thought I'd share some of our techniques, storage spaces, and some of my recent organizational purchases. I always feel so much better about myself when I'm organized - do you?